Photos: Erwin Olaf. Images courtesy of Vogue Netherlands. One of the many reasons we're drawn to beauty is the craft's close alignment to art. Manipulating appearances, creating a "moment" — we could just as easily be referring to a makeup session as a masterpiece in a museum. 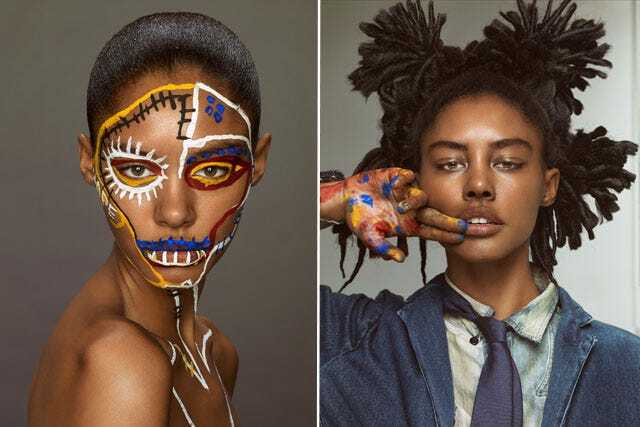 And, these incredible images by photographer Erwin Olaf, inspired by famed painter Jean-Michel Basquiat, really bring the connection between art and beauty to life. The photos will appear in the March issue of Vogue Netherlands as part of a feature called "Les Beaux Arts," on modern art, as inspired by the Paris fashion crowd's current obsession with it. Each model was photographed twice; once done up as an artist (Jackson Pollock and Karel Appel were also covered), and then as an interpretation that painter's signature work. When it comes to Basquiat, the story is truly told by hairstylist Paolo Ferreira's take on his signature 'do — and finished by Topolino's makeup artistry. Photo: Erwin Olaf. Image courtesy of Vogue Netherlands.